At the first lesson we will look what tools and materials you will need to prepare for further occupations. Needles select according to yarn thickness. Thickness of yarn is defined by a ratio of mass of yarn in grams and thread lengths: г / m. For example, if on the label you see designation 100g – 260m, it means that 260 meters of yarn will weigh hundred grams. Than less length of thread, falling on 100 g of yarn, that yarn is thicker. 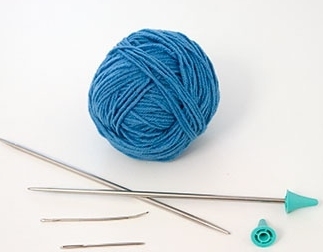 The general rule at selection of needles – needles have to be twice thicker, than yarn. It is possible to be guided by the recommended number of needles which producers specify on the label. Number corresponds to diameter of needles in millimeters. Now we will not stop on all variety of knitting needles. You will need to acquire three sets of short needles of 5 pieces number 3; 3,5; 4. Until we have small samples and there will be quite enough length of these needles. Besides, short needles it is easier to knit. Further such needles will be useful to you for circular knitting, for example, for knitting of socks or mittens. Needles of various numbers are necessary in order that you defined the manner of knitting. Some knitters knit a touch, some are weaker. When you try to knit yarn of the same thickness different needles, you feel what is density of knitting and what number of needles is suitable for you better. If for some reason you have no sets of 5 needles, it is possible to use sets of two needles, but also, it is desirable to have different numbers. Needles in set two-edged. In this case we do not need it. Yet you have no experience, perhaps, loops will fly from needles. That it did not happen, you will need to get tips for needles. They are also on sale according to numbers, but the same tips are suitable for several numbers of needles. For example, from the 2nd on the 5th or from the 5th on the 10th. Tips are used and when you need to leave knitting for a while: the free ends of needles are closed, and loops do not fly. Yarn for training it is possible to get the acrylic, woolen, or mixed acrylic and woolen. From other types of yarn, for example cotton to learn to knit more difficult. Yarn has to be usual, smooth. Shaped or fluffy yarn like a mohair will not approach – from such yarn it is more difficult to knit. On thickness yarn has to be average, about 200 – 300 m / 100 g. Buy yarn of light tones for training. So you will better see loops and eyes will be tired less. In more detail about the choice of yarn for hand knitting. At a knitted needle a stupid tip that yarn fibers, and a big ear were not torn. Such needle is required to us for performance of knitted seams. It is also convenient to use a needle with the bent tip. You can see necessary tools in the photo at the beginning of this article.